The Nokia 5230 Nuron has free maps and voice-guide navigation via Ovi Maps, 3G, and excellent call quality, all at an affordable price. It's also the first Nokia smartphone with a U.S. carrier to offer access to the Ovi Store. Everyone loves a great deal, and Nokia and T-Mobile are serving up one heck of a value with the Nokia 5230 Nuron. Available starting March 24 for just $69.99 with a two-year contract, the Nuron is a full touch-screen smartphone that offers 3G support, access to the Ovi Store, and free maps and voice-guided, turn-by-by navigation via Ovi Maps. MKV video, also well-known as Matroska video takes lots of advantages on modern codec. And some users would like to rip DVD movie to MKV or convert AVCHD M2TS recordings to MKV to maximally preserve video quality. Although MKV is more and more popular on computer, and even Windows 7 supports MKV video natively, you may find the Nokia 5230 Nuron does not recognize MKV files. This is because MKV is a container format which can contain various codecs, only a small subset of which (e.g. H.264, Xvid) the Nokia 5230 Nuron can play. In fact you simply need a powerful video converter software to transcode your MKV video to Nokia 5230 Nuron recognizable video format, for instance convert MKV to AVI. WinX HD Video Converter Deluxe is just masterful at the job of converting HD/4K/8K MKV to Nokia 5230 Nuron. Only 4 steps to finish MKV to Nokia 5230 Nuron conversion. Step 1. Load MKV by clicking + Video button. Step 2. Select output profile under category "Device Profile -> BlackBerry Nokia -> to Nokia". Step 3. Click Browse to specify output folder. Step 4. Begin converting MKV to Nokia 5230 Nuron. 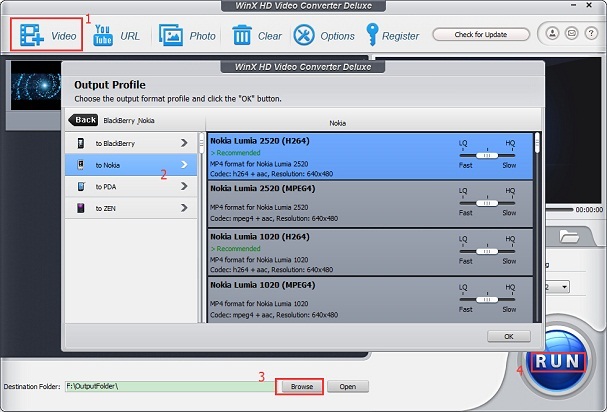 WinX HD Video Converter Deluxe: Versatile video conversion utility equipped with online video downloader, video editor and photo slideshow maker. Hundreds of A/V codes & output profiles help convert 4K, 1080p HD, MKV, AVCHD, AVI, MPEG, MP4, MOV, WMV and more without a hitch for playback on iOS/Android/Windows mobiles, Windows (10) PC, Mac etc. Hardware Acceleration to speed conversion up to unparalleled No.1 fast. WinX MediaTrans: All-in-one iOS file manager without using iTunes at all. Aiming to data backup and two-way transfer media files between iDevice and Windows (10) PC, this mobile manager provides a smarter and more secure way for syncing photos, music, videos, e-books, voice memos, iTunes U and Prodcast files. Better yet, it can auto convert video audio formats for iPhone iPad, make free ringtone and mount iDevice as USB. Built in hundreds of A/V codecs and equipped with Photo Slideshow Maker, Website Video Downloader function. As all-in-one HD Video Converter software, it helps you transcode among HD video formats like convert AVCHD M2TS to MKV, convert Blu-ray to MKV, MKV to MP4, etc. Moreover, it is embed with numerous profile settings for Apple, Sony, Microsoft portable devices as well as iOS, Android, Symbian mobile Phones.